Ranger radios (RCI radios). Excellent service, low prices, repair, warranty, tuning and fast world wide shipping on the latest Ranger 10 meter radios. *New Feb 2015, RCI936FC4. The new RCI 2950 Dx and RCI 2970 N2 Ranger radios are our two best radios for 10 meter and 12 meter. These are the newer 2010-2011 models with the black display and green LCD readout. Ranger radios have a two year manufactures warranty. All of our 10 meter radios come with a factory microphone, power cord, mounting bracket and mounting hardware. This section is for Ranger 10 meter radios. 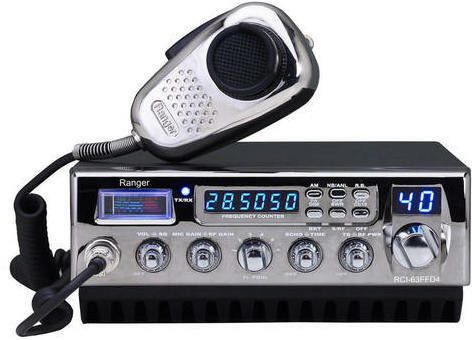 For Ranger Cb radios see Cb radio in the left menu. Don't forget to add our $35 tuning. Our Modulation Upgrade is not offered for the Ranger radios on this page. Due to the high power output the Ranger 10 meter radios they have all the modulation they need with our regular $35 tuning. Other power upgrades will likely distort the output. If anyone other than GI Joe's tunes or works on your Ranger radio that does void your warranty with us. Tuning includes aligning the receive, transmit, meters, any other necessary adjustments and a visual inspection of the radio. If you do encounter a problem you should contact GI Joe's first for help or instructions. On the Ranger radio "View Detail" pages you will find more information and tuning selections. Also there are options to make the Ranger radio a base by adding a 120Vac to 12Vdc power supply. The smallest power supply listed is the smallest one that will run the radio. You will only need one of the larger power supplies if you plan to run more equipment with higher current (Apmerage) demands. As there are not a lot of base radios on the market the mobile with external power supply option gives you more for your money (as compared to a base radio) and a better selection of radio features to fit your needs. **ORDERING TIP: Shipping cost per item drops substantially as you as you add more items. Example: 2 mobile radios only cost $4 to $7 more to ship than one radio. Adding an antenna with a radio often only ads $3 to $5 to the shipping cost. You can save some money on shipping by getting everything you need on one order. The more you order the less shipping you pay per item. New April 2018 RCI-39VHP with smaller size chassis the same size as a Cobra 29 Cb radio. The RCI-39-VHP packs a lot of power in a smaller size radio with 80 watts, dual echo control , variable talk-back, variable RF power control and more. **NEW JUNE 2015. Excellent service, low prices, repair, warranty, tuning and fast world wide shipping on the RCI2970N4 Ranger 10 meter radio. Introducing the new 400w Ranger 2970N4. The new RCI2970N4 is now available. Excellent service, low prices, repair, warranty, tuning and fast world wide shipping on the RCI2970N2 Ranger 10 meter radio. The new 200w Ranger 2970N2 model has taken the place of the 150w Ranger RCI2970Dx model. The new RCI2970N2 is now available. 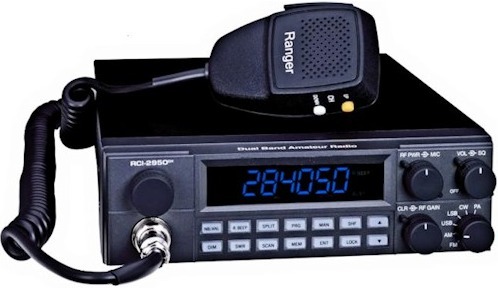 The New Ranger RCI69FFB4 Ranger radio. This new Ranger radio has AM/FM/SSB, echo, variable talk back, blue frequency counter and channel LED's, Heat sink on bottom with two internal fans and 400+ watts power after tuning on this new Ranger radio. *Now with Black case. Heat Sink on bottom. The RCI-63FFC2 Ranger radio is back. AM/FM, dual echo, variable talk back, blue frequency counter and channel LED's, Heat sink on bottom with two internal fans and 200 watts power after tuning on this new Ranger radio. The RCI 936FC4 is replacing the RCI 63FFC4. The new RCI 936 FC4 has a chrome face with black covers. Four 2SC-2879 output finals for 300w to 350w+ output after tuning. Talk-back control knob (no echo). Mic jack on the front. The New Ranger RCI63FFC4 Ranger radio. This new Ranger radio has AM/FM, echo, variable talk back, blue frequency counter and channel LED's, Heat sink on bottom with two internal fans and 400 watts power after tuning on this new Ranger radio. 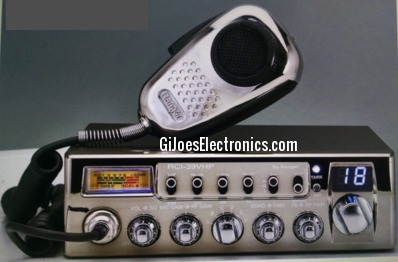 **The newer model of this radio is the RCI 936FC4. It's basically the same. The new model does not have echo, it has a front mounted mic jack, it has crome face with black top and bottom covers. It does have a talk-back control knob. 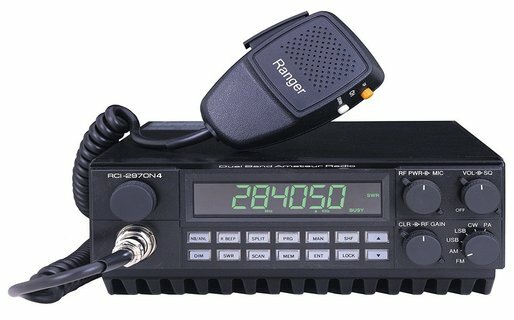 The New Ranger RCI69FFC2 Ranger radio. This new Ranger radio has AM/FM/SSB, echo, variable talk back, blue frequency counter and channel LED's, Heat sink on bottom with two internal fans and 200 watts power after tuning on this new Ranger radio. June 2011 - All of the Ranger C2 models have been discontinued by Ranger. We are out of the RCI 69FFC2. If more do become available we will list them here. 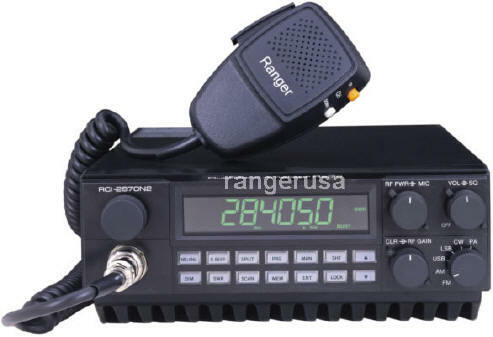 Excellent service, lowest price, repair, warranty, tuning and fast world wide shipping on the Ranger RCI2950Dx 10 meter & 12 meter radio. This is a newer version of the RCI2950Dx The new RCI 2950 Dx is now available.